Locate a Dealer Use our dealer locator to find a Canadian dealer for any of our products. Visit the Web Store Browse the products we distribute to dealers across Canada. What are the major differences between scope lines? Where do I send my scope for service, repair, or Custom Shop modification? How long does this typically take? Service currently requires approximately five days, not including shipping time. When shipping product for warranty or service, please include a note of instruction, return address, telephone number, and e-mail address. If you are having a chargeable service performed (reticle change, target adjustment installation, replacement of damaged components, etc. ), please include payment with the scope to avoid delays in returning the product. Please record the model and serial number of your product, and ship the optic only. Remove any mounts, rings, sunshades, or lens covers. It is recommended that you purchase insurance and retain a tracking number to document the arrival of your product. If you need any further assistance, please call our technical service department at 1-403-938-3255. My scope is too short for the action. What should I do? Today‘s scopes are getting shorter and shorter. You will need to use reversing front and rear bases and extended rings in a lot of cases. It is important to ensure the rings are not against the power selector ring when the scope is mounted, as this will cause damage to the scope under recoil, as well as make it difficult to adjust the power setting. My scope is running out of internal adjustment travel before I get properly sighted in. How can I obtain more travel? When encountering an issue involving exhausted adjustment travel it is likely related to the alignment between the scope and barrel. When producing a firearm, there are many different components, each having a tolerance specification. As these tolerances “stack,” the alignment between the receiver and the barrel changes; this is why 10 seemingly identical rifles will all require different amounts of scope adjustment to sight-in. This is also why some scopes will reach the end of the adjustment travel without properly aligning to the bore; running out of adjustment before you can place the bullet in the center of the target. This issue can be rather frustrating to the average rifleman who simply wants to sight-in and leave the adjustments in a single position, but to the long-range shooter who makes adjustments more often, the issue is compounded. People often want to know “how far can I shoot” with a particular scope, meaning how much elevation adjustment they will have for long-range shooting. This is not a question that can easily be answered because of the previously mention tolerance stack. As an example, let’s take 2 of the same 10 seemingly identical rifles mentioned earlier and see what happens when used for long-range shooting; both rifles are chambered in .308 Winchester, will be shooting 168 grain match-grade ammunition, and are mounted with scopes with having MOA of total adjustment travel (35-MOA up and 35-MOA down from center). Due to differing tolerances, rifle #1 requires 10-MOA of down adjustment from the scope to be sighted in at 100 yards and rifle #2 requires 10-MOA of up adjustment. This means that the scope on rifle #1 will have 45-MOA of up adjustment remaining, allowing the shooter to make the proper correction for shots up to 1,070 yards; rifle #2 will have 25-MOA of up adjustment remaining, allowing the shooter to make the proper correction for shots up to 780 yards. Even though the rifles seem exactly the same, #2 will require a long range base or shims much sooner than rifle #1. Elevation issues can be resolved by shimming (we will send shims free of charge if you would like). If more up adjustment is required, the rear of the base needs to be shimmed between the receiver and the base. If you need more down adjustment, the front base needs to be shimmed. In making this adjustment it should be noted each 0.001" thickness of shim equates to approximately 1-MOA (1 inch at 100 yards) correction. Shimming does not induce stress on the scope, but typically reduces stress by properly leveling the scope to be parallel with the receiver. If an issue exists on the windage axis, the correction needs to be made with windage adjustable bases or rings. Leupold offers windage adjustable bases (STD) which have two windage screws holding the rear ring. By loosening one side and tightening the other, they shift the rear of the scope right or left. It should be noted that shifting the rear of the scope to the left will cause the point of impact to shift to the left and vice versa. It should also be noted that if one axis is near the limit of its adjustment, there will be a reduction in the amount of adjustment on the other axis. If the elevation adjustment is near the top of the adjustment range, the windage adjustment will be reduced; if windage adjustment has been induced, there will be a reduction in elevation adjustment. This can be illustrated by drawing a circle on a piece of paper to represent the maintube of a scope. If you start in the center of the circle with your pencil, you can move an equal distance in any of the four directions: up, down, left, or right. If you start in the center of the circle and move upwards toward the top of the circle, you will see that the distance remaining to the left and right has been diminished. The same is true in any direction; if you start in the center of the circle and move to the left, you will have diminished travel to adjust up or down. ** It is not uncommon for lower quality optics to have more adjustment travel than their higher quality counterparts for a number of reasons, but is typically due to the use of smaller, less expensive internal components. When smaller parts are placed in the same size housing (maintube), they will have the ability to move farther, but will also have negative aspects relating to image quality and durability. In the diagrams above, the outer circle represents the maintube of the scope when looking through the optic. The black dot represents the erector system, or internal lens cluster that is moved when making windage/elevation adjustments on the scope. The thin lines help illustrate the amount of travel remaining on the opposite axis as windage/elevation adjustments are made; helping illustrate how an adjustment in one direction limits the amount of travel in the other. Represents a scope with the erector system in the center of the adjustment travel range; allowing for maximum adjustment travel on the elevation axis (the same is true for windage when the erector system is centered). Represents a scope with the erector system in the center of the adjustment travel range; allowing for maximum adjustment travel on the windage axis (the same is true for elevation when the erector system is centered). Represents a scope with the erector system near the end of the available travel in the up direction; drastically reducing the amount of windage travel remaining. Represents a scope with the erector system near the end of the available travel in the left direction; drastically reducing the amount of elevation travel remaining. Represents the scope on rifle #1 in the above example; when sighted-in at 100 yards. Represents the scope on rifle #2 in the above example; when sighted-in at 100 yards. Can I have a Bullet Drop Compensation (BDC) dial made for my scope? What information do I need to provide and how much will it cost? We can create custom BDC dials for virtually any Leupold scope with the exceptions of the Rifleman, LPS, Competition, and BR lines. If the scope in question does not currently have tall, finger-adjustable adjustments (target style, M1, M2, or M3) currently installed, the scope will need to be sent to the Custom Shop for this addition. In most cases, we can only install target style or M1 style adjustments in scopes currently utilizing low-profile, hunting style adjustments. The Custom Shop will need to know the cartridge being used, the exact bullet type and weight, the average elevation above sea level, and the average temperature in which you will be shooting. This can be filled out on this web page by clicking Custom Shop how to order. When done you can click submit and it will come directly to the custom shop. We understand elevation and temperature measurements can vary dramatically, even through the course of one day, so a simple average will work rather well. For best results, we recommend taking multiple chronograph measurements of exact muzzle velocity and setting the BDC dial for the average. If no chronograph is available, most factory loaded ammunition includes an estimated muzzle velocity. When was my scope manufactured? Every Leupold scope produced since 1974 will have a letter included in the serial number acting as a date-code. Scopes using a letter as a prefix (the beginning of the serial number) were produced between 1974 and 1992. Scopes using a letter as a suffix (the end of the serial number) have been produced after 1992. On the chart below, you will notice the letters “I,” “O,” and “Q” have been omitted as they are easily mistaken for “1,” “0,” and “0” respectively. Can I have an existing scope refinished? Unfortunately, we cannot refinish a scope, the external components must be replaced. To effectively remove scratches, dings, or ring marks, the affected area must be replaced. The most common request relates to ring marks; in these instances the Leupold Custom Shop can replace the maintube. Can I have the reticle in my scope changed to another style? What is the purpose of the dot above the crosshair on Leupold custom, ballistically matched reticles? This dot can be used for range estimating purposes. Certain VX-III scopes offer a Duplex range estimating feature which allows the user to bracket a deer between the center intersection of the reticle and the top post (see your Leupold owner’s handbook for details). Leupold custom, ballistically matched reticles allow the user to estimate the distance to a deer (measuring 18" from backbone to brisket) using the dot, or the distance to an elk (measuring 26" from backbone to brisket) using the top heavy post. Why does my BAS reticle (Boone & Crockett Big Game; Varmint Hunter’s; LR Duplex; LRV Duplex; and Custom, Ballistically Matched reticles) need to be used on a specific magnification setting? Leupold Ballistics Aiming System reticles such as the Boone & Crockett Big Game; Varmint Hunter’s; LR Duplex; LRV Duplex; or the Custom, Ballistically Matched reticles are typically installed in scopes with a rear focal plane design; allowing the user to “tune” the reticle for use with multiple loads. 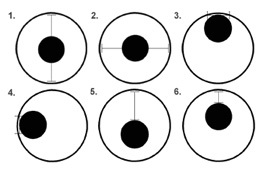 As discussed in question 11, changing the magnification in rear focal plane designs changes the sub-tension of the reticle, effectively changing the amount of holdover provided by the long-range aim points of these reticles. This can be observed by placing the main aim point (crosshair) in the center of a target, changing the magnification, and observing the resulting effect on sub-tension. The observer will notice that though the main aim point remains in the center of the target, the holdover points appear to move “up” the target as magnification increases, and “down” the target as magnification decreases. As such, faster loads with flatter trajectories will require a higher magnification setting than slower loads with more bullet drop. It is important to note that since the main aim point is located directly in the center of the field, it does not move as the magnification changes; this allows users of these reticles to sight-in on any magnification setting. One example commonly used to help visualize this effect involves viewing a deer 400 yards away with a fictitious scope ranging from 1x to 100x. If the scope is set to 1x magnification and the main aim point is placed directly on his shoulder, the deer appears rather small and occupies very little of the visual field. Because the deer appears small and only occupies the very center of the field, the 400-yard aim point is located well below the deer, representing many feet of drop. As the magnification is increased, the main aim point remains on the deer’s shoulder, but he begins to fill more of the visual field. When 100x is reached his shoulder fills the entire visual field, placing the 400-yard aim point only inches below the main aim point. The result is that as magnification is increased, the target begins to fill more of the visual field, making the holdover points appear to “walk” up the target, thus representing less drop. As magnification is decreased, the target gets smaller, making the holdover points appear to “walk” down the target, thus representing more drop. What is the difference between a front focal plane (1st focal plane) reticle and a rear focal plane (2nd focal plane) reticle? Most riflescopes utilize a rear focal plane reticle design, creating a situation where the apparent size of the reticle does not change as the magnification is adjusted. In these scopes, the amount of target area covered by the reticle is inversely proportional to magnification; as the magnification is increased, the amount of target area covered by the reticle is decreased. This can be seen by looking through a variable magnification scope and increasing the magnification setting. As the power is increased, the apparent size of the target is increased, but the reticle appears to remain the same size; the result is that the reticle covers less of the target when the magnification is increased. Rear Focal Plane Reticles– In general, hunting scopes are designed with rear focal plane reticles; this allows the reticle to appear bolder and heavier when set to low magnification, but appear thinner and more precise when set to high magnification. Most hunters set variable magnification scopes to a mid-level magnification for general carry situations, reducing magnification in low-light or heavy cover situations, and increasing magnification for longer, more precise shooting solutions. Rear focal plane designs allow the reticle to appear bolder in low light, making them easy to see and faster to acquire when the light is fading. This same property is advantageous in situations where heavy cover may be encountered, allowing easy differentiation between the reticle and vegetation. If a longer distance shot is to be taken, the magnification can be increased, creating a situation where the reticle covers less of the target, allowing the user to be more precise. If a front focal design were used, hunters would notice that in low-light or heavy-cover situations, the reticle would become much smaller and more difficult to see on low magnification; right when they need the reticle to be bold and easy to acquire. Front Focal Plane Reticles – Many tactical groups prefer front focal plane designs because common tactical reticles serve a dual purpose: a point of aim and a means of measurement. Reticles such as a mil dot are based on a specific sub-tension and require exact feature spacing to be accurate; if this type of reticle is used in a rear focal plane design, the scope must be used on a single, specific magnification (typically high power). Placing this type of reticle in a front focal plane design allows the operator to use the scope on any magnification while retaining the exact spacing of the reticle features. With all of the recent changes, it can be difficult to know exactly how each product will perform. Every scope Leupold produces, including the Rifleman, is fully coated (all lenses, internal and external, are coated) and utilizes glass, coatings, and optical systems of equal or better quality than the discontinued Vari-X II’s of the past. Decreased cost associated with the Rifleman line is due to increased efficiency in our production process, not from reduced quality. To make things easier, a brief summary of our current scope lines has been compiled including the most prominent features belonging to each. It is important to note that every lens (internal and external) in every Leupold scope is coated, but the type of coatings will vary. “Fully multicoated” indicates that each lens in an optical system is coated with multiple layers of lens coating, such as Multicoat 4. “Fully coated” indicates that each lens is coated with a single lens coating; Leupold uses magnesium fluoride. “Standard multicoated” scopes have a combination of coated lenses and multicoated lenses. New for 2007, the VX-7 line takes full advantage of Leupold’s 100 years of experience. The VX-7 uses ¼-MOA SpeeDial adjustments which eliminate the possibility of losing adjustment covers. DiamondCoat 2 exterior lens coatings provide the highest level of scratch resistance ever offered. Xtended Twilight internal lens coatings work to optimize the wavelengths specific to twilight conditions, making the VX-7 the best low-light scope we’ve ever produced. The use of a 4-to-1 erector system provides a larger range of magnification, making this line the ultimate scope for serious hunters. The LPS line uses ¼-MOA, low-profile, finger-adjustable adjustments; a fast-focus eyepiece; and our DiamondCoat lens coatings to provide incredible light transmission values with the addition of remarkable scratch resistance. The VX-L was new for 2006, and uses ¼-MOA or 1/8-MOA adjustments depending upon model, has a fast-focus eyepiece, and utilizes an objective lens specially shaped to allow large objective scopes to be mounted in low rings. VX-L scopes use a combination of Index Matched and DiamondCoat lens coatings as well as edge-blackened lenses to produce extremely low glare and unprecedented light transmission values. The VX-III line was new for 2004, and uses ¼-MOA, low-profile, finger-adjustable adjustments and a fast-focus eyepiece. VX-III’s are fully multicoated and Index Matched to ensure that each lens has the best possible coating, producing total light transmission values higher than ever seen before. Beginning in 2004, all tactical scopes are included in the Mark 4 category and will have the same features as past tactical models with the addition of a fast-focus eyepiece and Index Matched lenses; there are two exceptions which include the CQ/T and 3-9x40mm PR. The CQ/T has always utilized a combination of DiamondCoat (external) and Multicoat 4 (internal) lens coatings, and the 3-9x40mm PR is fully multicoated using Multicoat 4. 2003 tactical scopes typically had fully multicoated lenses utilizing Multicoat 4. The Vari-X III line (discontinued for 2004 with introduction of VX-III) has seen little change and is still optically the same as those produced in the 90s. Vari-X III’s utilize ¼-MOA click adjustments and are fully multicoated with Multicoat 4. The VX-II line (2003 and older) uses a combination of Vari-X III and Vari-X II (discontinued) technology. VX-II’s also utilize ¼-MOA click adjustments, but the lens coatings are unique. The external lenses are coated with Multicoat 4 and the internal lenses are coated with magnesium fluoride. Beginning in 2004, the VX-II line is fully multicoated and will perform comparably to the discontinued Vari-X III line. The VX-I also utilizes a combination of Vari-X III and Vari-X II technology, utilizing ¼-MOA friction (non-clicking) adjustments. The external lenses are multicoated and the internal lenses use magnesium fluoride. Though the Rifleman line of scopes uses a different maintube (for aesthetic reasons), it is optically the same as the Vari-X II (discontinued for 2001). The adjustments are exactly the same as the Vari-X II (½-MOA friction) as are the lenses and coatings. All lenses, internal and external, are coated with magnesium fluoride. Basically, the Rifleman is a newer-looking matte finish version of the Vari-X II that helped build the Leupold reputation. It is important to note that Custom Shop options (reticle changes, target adjustment installation, etc.) are not available for the Rifleman line of scopes. Beginning in 2005, there were changes to the fixed magnification scope lines, updating them to follow the current convention used by the VX series of scopes; all fixed magnification scopes now have an “FX” designation followed by a number indicating the combination of technologies used in that product. For example, an FX-II will have the same lens coatings and adjustments as a VX-II, an FX-III will have the same lens coatings and adjustments as the VX-III line, etc. There was also a shift from using the term “compact" to the term “ultralight,” meaning that the FX-II 2.5x20mm Ultralight which was introduced in 2005 will be a fixed magnification scope with ¼-MOA click adjustments, fully multicoated lenses, and will have the compact eyepiece. When using my RX® rangefinder, how do I turn modes on/off? Rangefinder Buttons – RX-I and RX-II models have two buttons. The Power/Set button is located on top of the rangefinder, and the Mode button is located on the left side of the rangefinder. RX-III and RX-IV models have three buttons, all located on the top of the rangefinder. The Power button is closest to the user’s eye and is the largest. The Mode button is located in the middle of the three buttons. The Set button is farthest from the user’s eye. The Power button is used to activate the rangefinder, as well as actuate the laser (obtain a return). All Leupold rangefinders shut off after a brief period, saving battery life and menu changes that may have been made. The Mode button is used to enter and to navigate through the Quick Set Rotary Menu. Pressing the button initially enters the menu, each subsequent depression advances to the next available icon. The Set button is used to turn the highlighted icon (in the Quick Set Rotary Menu) on or off. Each time the Set button is pressed, the selected icon toggles from off to on or vice versa. If the Set button is held depressed prior to entering the Quick Set Rotary Menu, the backlight (RX-III and RX-IV only) will illuminate until the button is released. Activating a mode: The Mode button is used to enter, and advance through, the Quick Set Rotary Menu. The Set button is used to toggle each menu option on/off. To activate a mode, press the Mode button until the appropriate icon is flashing, then press the Set button. If the icon is displayed steadily, the mode is turned “on." Deactivating a mode: The Mode button is used to enter, and advance through, the Quick Set Rotary Menu. The Set button is used to toggle each menu option on/off. To turn a mode “off” press the Mode button until the appropriate icon is flashing, press the Set button until the icon is displayed steadily, then press the Set button again until the icon resumes flashing. It is important to note that as the user navigates through the Quick Set Rotary Menu, each icon will flash to show their current position in the menu. This initial flashing of the icon is only intended to show currently location in the menu and does not indicate the status of that mode (on or off). To make sure a mode is turned off, it should be turned on, then off; this will require pressing Mode until the icon is flashing (showing the user’s current location in the menu), pressing Set to turn the mode “on” (the icon will display steadily), then pressing Set again to turn the mode “off” (the icon will begin flashing again). This can be a bit confusing as the icon will flash initially to show the user’s location in the rotary menu, then it will display steadily to show the mode has been activated, then will flash again to indicate the mode has been deactivated. Flashing serves a dual-purpose, it initially acts as a place holder in the menu, then it acts to indicate a deactivated (turned off) mode. My scope isn’t Tracking, what should I do? A scope will only track if mounted with the reticle and target both being level. A level must be used when mounting the target, and a plum line hung to verify the scope and rifle are plum to the target. 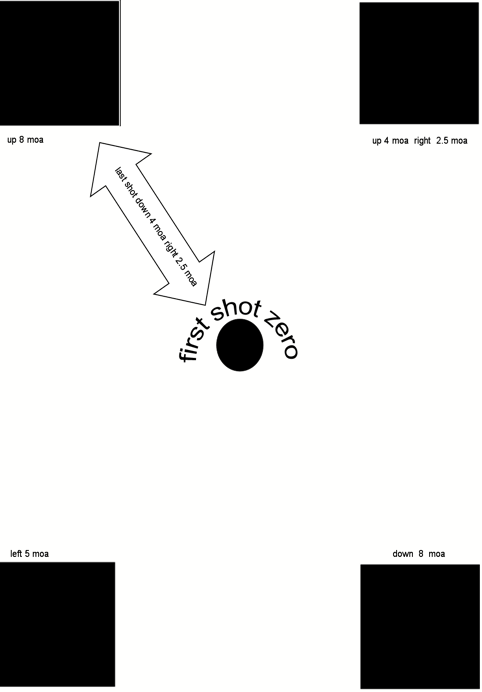 Please feel free to copy the target provided and follow the directions on the target. How do I install a new BDC dial? Installation of Target and M1 Style BDC dials: To install your Leupold Custom Shop BDC dial, please remove the original dial by loosening the set screw(s) located on the knurled rim of the dial. Lift the dial upward and clear of the adjustment mechanism. Place your new BDC dial on the adjustment mechanism and tighten the set screws. In the case of the target knob BDC, it is particularly important not to over tighten the three set screws. Installation of M2 and M3 BDC dials & CDS dials: To install your M2 or M3 BDC dial, please remove the original dial by loosening the three set screws located on the knurled rim of the dial. Lift the dial upward and clear of the adjustment mechanism. Before placing the BDC dial on the adjustment mechanism, please note the location of the steel stop-ball on the bottom side of the dial. Orient the dial on the adjustment mechanism so that the stop-ball is to the right of reference mark on the back side of the adjustment housing. Tighten the set screws. Zeroing: We recommend that you zero your scope at the shortest distance for which you have a reference mark on your BDC dial. Most of our Custom Shop dials begin at 100 or 200 yards/meters. After you have achieved a good zero, simply loosen the set screws on the dial and slip it positive or negative until the appropriate range reference number lines up with the reference mark on the back of the adjustment housing. For example, if you zeroed the rifle at 100 yards, slip the dial to the 100 yard mark and tighten the set screws. Custom Windage Dials: Custom windage dials are installed in the same manner as the elevation dial. Please note that M3 and M2 windage dials do not have a stop-ball. For best accuracy, we recommend that you zero your windage dial during windless conditions. Once zero is achieved, slip the dial to the no wind mark and tighten the set screws. The dials on the scope are marked in the direction of bullet impact. For your bullet impact to move up the sight must move down. (Treat the scope the same as if it were a front sight). How do I install my VX-6 Custom Dial System? Caution: Always verify and be certain that the firearm is unloaded and safe before undertaking any work upon it or the riflescope. Remove the plastic elevation adjustment dial by lifting straight up. Once the dial has been removed you will have a view of the adjustment gear ring and two 1/8” hex head screws. Using a 1/8” hex wrench, remove both screws and lift off the adjustment gear ring. Install the Custom CDS dial over the adjustment turret post, align the starting zero point of the dial (“1” for a 100 yard zero, or “2” for a 200 yard zero) with the zero index mark on the maintube of the scope and tighten the 3 .050 hex head lock screws. Caution: Do not over tighten! Five (5) “environmental” factors that affect accuracy — Temperature, Humidity, Elevation / Barometric Pressure, Wind, and Light. It affects the trajectory of the bullet. It affects the temperature of the barrel. It affects the ammunition we use. It affects the performance of the shooter. As steel is heated the molecules "relax" therefore in hotter temperatures or after repeated firing a "hot" barrel has more flex/whip to it which will open up your group size, etc. A simple fact of physics tells us that warm air is thinner or less dense than cool air. As a result, a bullet encounters less resistance and expends less energy as it travels from the firing line to the target on a warm day than it does on a cooler day. On our ballistic calculator a 308 150gr SST with a velocity of 2900 feet per second will hit 27.81 inches low at 400 yards at 80 degrees F. Drop the temperature to 20 degrees and leaving everything else the same it drops 29.31 inches. This is not taking into account the effect of the cartridge temperature change, only the atmospheric change. Many shooters believe that humidity (i.e. the amount of moisture in the air) can have a serious impact on accuracy. The theory is that air containing a high degree of moisture must be more dense than dry air. As a result, it must offer more resistance to a bullet in flight than does dry air. The fact of the matter is that the amount of humidity in the air has virtually no effect on bullet accuracy. That’s because a water molecule weighs less than a dry air molecule. Moist air is actually less dense than dry air. In fact, when the surrounding air is said to have 100% humidity (i.e. it is holding as much water vapor as it can at its current temperature), it still only contains 4% moisture. The same round in the example above at 20 degrees was at 78% relative humidity, lowering the R.H. to 20 % brought it from – 29.31 to – 29.14. So you can see that it is not really much of a contributing factor. Elevation and barometric pressure can definitely have a significant effect on the accuracy of your load. Why? Because they affect the density of the air, and therefore, the amount of resistance it exerts on the bullet as it travels to the target. The above 400 yard example at sea level would be -30.68 inches at 5000ft above sea level it would be -28.06 inches. I am sure we have all heard the guy shooting the 250 gr 338 mag telling all who were in hearing range how his bullet isn’t affected by wind. Wind pushes a Boeing 737 around so guess what! Here is that 338 bullet doing 2800 feet per second and let’s see what the ballistic calculator says. This is at sea level and 60 degrees Fahrenheit and FULL VALUE 90 DEGREE WINDS WIND ANGLE –DIRECTION WILL AFFECT THESE VALUES. Distance is at 100 yards because that is where most of us are sighting in and saying the scope is changing zero from one trip to the range to the next. So if we have a reversing wind condition and one shot in each condition at 10 MPH you have a total shift of a difference of 1.24 inches. The change in wind direction will also affect the impact up and down slightly. This is only 100 yards! 500 yards on a reversing 5 MPH wind condition will change impact by 3 inches and 10 MPH is 40inches. If you are not using some type of wind indicator and keeping a log of conditions from one range trip to the next you cannot have any way of knowing why the impact changed! The fifth and final environmental factor that we need to consider when shooting at Long Range is Light — or said another way, the quality and amount of light that is illuminating our target. “Light’s Up - Sights Up” and “Light’s Down - Sights Down”. strong>If you fired a shot and the sun is behind a cloud and your next shot is fired when the sun is out from behind the cloud your second shot will hit low. I cannot tell you how low, only you keeping a log and documenting the light condition can help you with this one!! The above points out some of the atmospheric changes which can cause day to day point of impact shifts. Things such as changes in ammunition lot #, changes in ammunition brand, shooting a different range, stock bedding or loose action screws, etc. have not been discussed. The point being that if you sight your scope in at the range and it shoots great groups and a week later you go to the range and it shoots to a different point of impact or your group opens up do not assume it is the scope. A scope sitting in your firearm rack or gun cabinet does not "move" by itself. Normally there is another external factor such as one of those mentioned which has caused the issue and needs to be corrected.